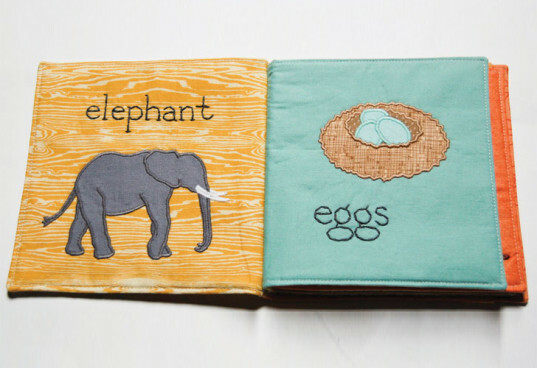 Victoria van der Laan has been making gorgeous custom cloth books and selling them through her Etsy store Ex Libris for a few years, but now she's working to produce multiple copies of six amazing books. Her new line of cloth books will be released monthly and available for purchase as a cloth book of the month club subscription for 3, 6, 9 or 12 months, or individually. Victoria’s handmade cloth books are both beautiful and imaginative. She uses raw edge applique, bold colors, and non-traditional images to create modern and unique 6-inch square eco-friendly books for babies and kids. Spoonflower, a company that prints self designed fabrics in small batches, will enable her to release a limited run of 50 copies of each of her six designs. The designs included in the book of the month club will feature gender-neutral colors and themes including nature, science, musical instruments, birds, transportation and mammals. Each will be 6 pages, and the books will be printed on 100% organic cotton sateen fabric. Originally, Victoria launched her cloth book business as a way to fulfill her creative need and help to support her family with her two kids, Lyric and Tigerlily, at home. Now, she wants to make her designs available to more people, so she launched a Kickstarter campaign. You can donate money to Victoria’s Kickstarter campaign – she’s already met her goal – but if you keep on giving, she’ll be able to produce more books. Her new organic cotton cloth books will also be for sale on her Etsy site in the coming months. Victoria's handmade cloth books are both beautiful and imaginative. 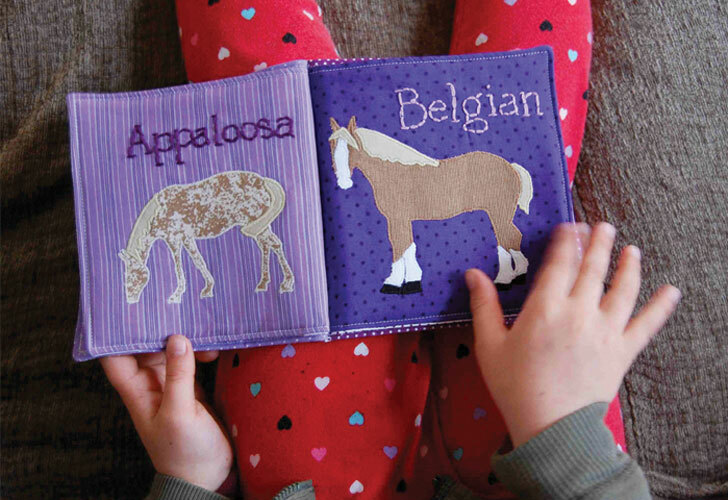 She uses raw edge applique, bold colors, and non-traditional images to create modern and unique 6-inch square eco-friendly books for babies and kids. Spoonflower, a company that prints self designed fabrics in small batches, will enable her to release a limited run of 50 copies of each of her six designs. The designs included in the book of the month club will feature gender-neutral colors and themes including nature, science, musical instruments, birds, transportation and mammals. Each book be 6 pages, and the books will be printed on 100% organic cotton sateen fabric. Originally, Victoria launched her custom cloth book business as a way to fulfill her creative need and help to support her family with her two kids, Lyric and Tigerlily, at home. Now, she wants to make her designs available to more people, so she launched a Kickstarter campaign. You can donate money to Victoria's Kickstarter campaign - she's already met her goal - but if you keep on giving, she'll be able to produce more books. Her new organic cotton cloth books will also be for sale on her Etsy site in the coming months.